“UI Experiment: Fancy Forms (previously Better Forms)” – Forum Thread – Discuss – Symphony. This is an open discussion with 36 replies, filed under Extensions. A new extension, "Better Forms" is now available for download. Comments and feedback can be left here but if you discover any issues, please post it on the issue tracker. Simone, this is very nice! The only thing that bothers me is that the color doesn’t immediately change to blue on click — the grey “hover color” will stay until the cursor is leaving the clicked item. The only thing that bothers me is that the color doesn’t immediately change to blue on click — the grey “hover color” will stay until the cursor is leaving the clicked item. Thanks for the feedback! Changed in the last release. :) Is it any better? Thank you, I think selecting is much easier now. But I am afraid the “select all” and “deselect all” feature is broken. Whops, that should be fixed with the latest commit. I know some people aren’t happy with these colours, but since they are used throughout the backend I didn’t want to break this convention. Suggestions are welcome, anyway! Very nice! Select boxes are so ubiquitous but so clunky. I’m using Symphony 2.1.2, and this isn’t updating to reflect changes to fields that Symphony makes as I’m using forms. For instance, any select box added to the DOM when I click on “Add new item” in the section editor isn’t prettified. That is annoying but not fatal. 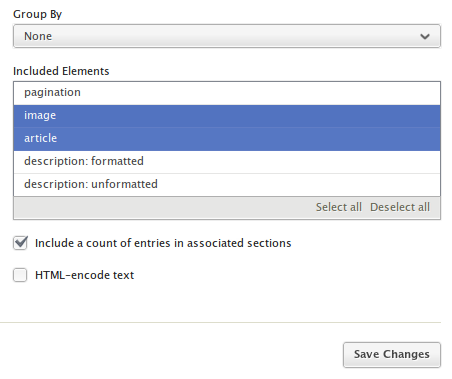 Unfortunately, the “included elements” field in the data source editor doesn’t update when I change the source section. Hi Simone, Great extension, beats my multiselect to checkboxes extension, which I haven’t updated in a while. Great work, Simone. I’ve just discovered a bug on button styling. I’m on Chrome 9 on Mac. Two homemade jQuery plugin called symphonySelectbox and symphonyCheckbox to replace respectively instances of <select> and <input type"checkbox"> with more advanced UI elements. Consistent styles (using modern technologies like CSS3) for text inputs, textareas and buttons. Note: This extension is not currently compatible with the latest build of SubsectionManager. Just wanted to say that I love using this extension. I figured your description was hyperbole but learned that you were quite honest about it. One tiny visual issue I found is that I can hardly see the delete button. Great extension, but it doesn’t play nicely with the Nick Dunn/Rowan Lewis Publish Filtering extension. It wipes out the the drop down selection boxes on that extension. D’oh, I though I fixed that! Which browser/version are you using? Is that screenshot coming from Symphony 2.2 or lower? Great extension, but it doesn’t play nicely with the Nick Dunn/Rowan Lewis Publish Filtering extension. Will have a look at it, thanks Brian. Can this extension be used on frontend too?